Hey everyone! 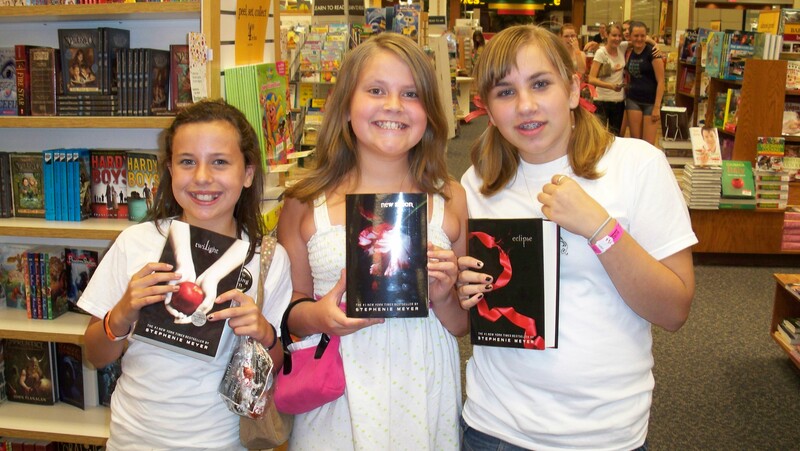 Since most of our staffers all went to a release party for Breaking Dawn, we thought it would be cool if we all shared our experiences! On this page you will find thoughts and photos from around the county, brought to you by Twilight Series Theories volunteers. And be sure to comment with all of YOUR great experiences too! 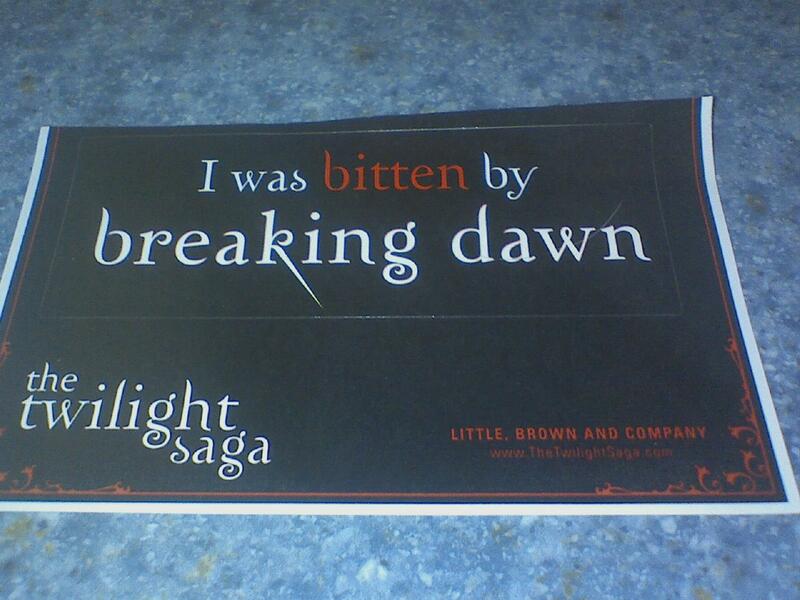 My Breaking Dawn Party experience! Okay everyone this was one of the best experiences i have had in my life!! good at helping us! haha we just had so much fun. 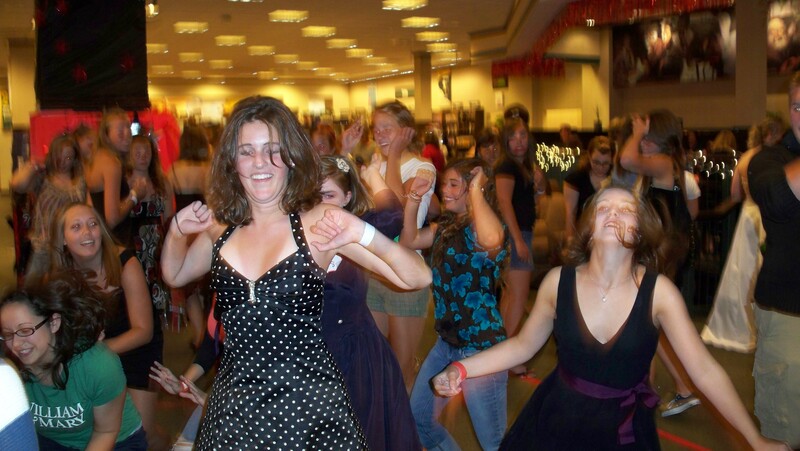 Chelsea here, and I’m here to give you the lo-down on what transpired at the Lynnhaven Barnes & Noble Release party that I went to! 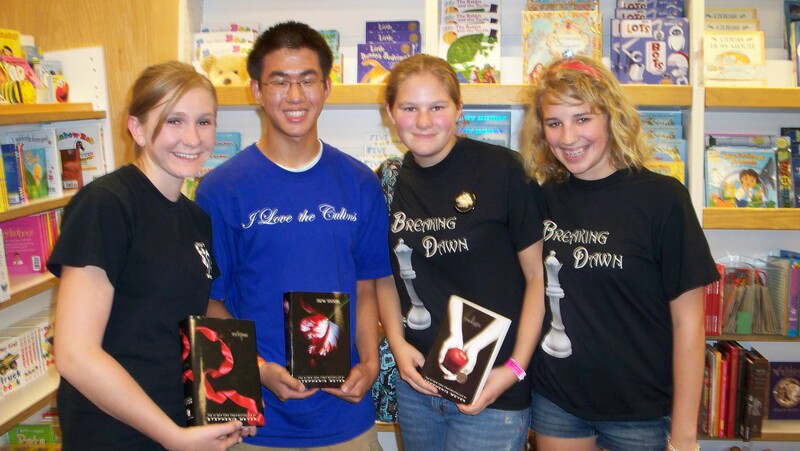 So if you’re not already reading Breaking Dawn…go ahead and take a quick look at how much fun there was! I didn’t get to do a lot because I got there too late but I was able to meet some fantastic people! There were some fantastic events like Bookmark Creating, Bracelet making, Costume Contests, Polaroid Prom Pictures & soooo much more!! 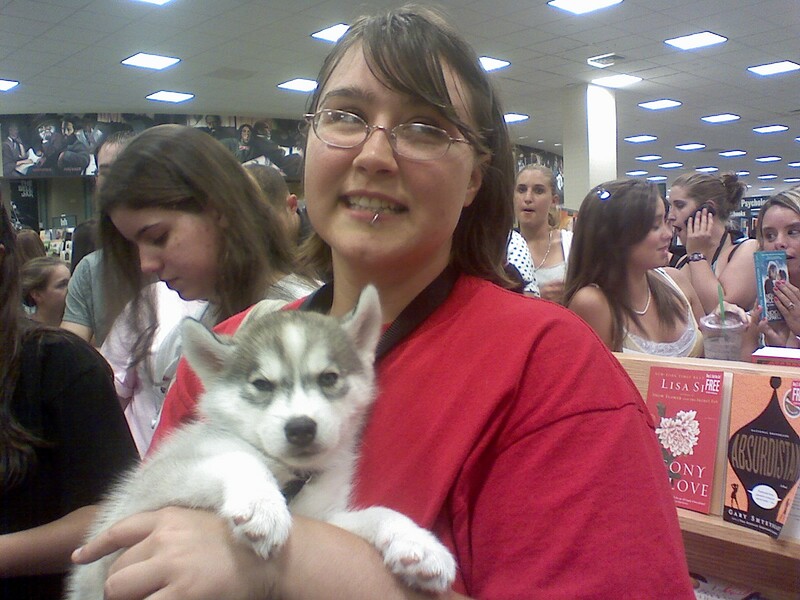 I met up with Rachel at the B&N and got to meet her Jacob, her 8 week old puppy named Beau. A pure Siberian Husky puppy with the calmest disposition and his owner was just the same. “I got to bring my own Jacob…so it was like perfect timing!” Rachel said as we waited for our ticket group to be called. The Costume Contest was great and there were some great entries but my favorite by far is in a photo below! A little girl dressed as Jane I believe. So great! It was truly a lot of fun and I did take some photos but I apologize for the quality as they were taken by my cell phone…(lol my camera decided to desert me!). Check these out and if you were there, I’m totally sorry I didn’t chat with you!! YAY BREAKING DAWN! Beau and Rachel hanging out with us! Okay, so I started off planning to just attend my local Walden Books’ release party, but I quickly became a party hopper! You see, there is a big Barnes & Noble right across the street, so I got my share of both, which I loved for different reasons. First stop of the night, Walden Books. There weren’t many people at this release party, maybe 40 or 50. 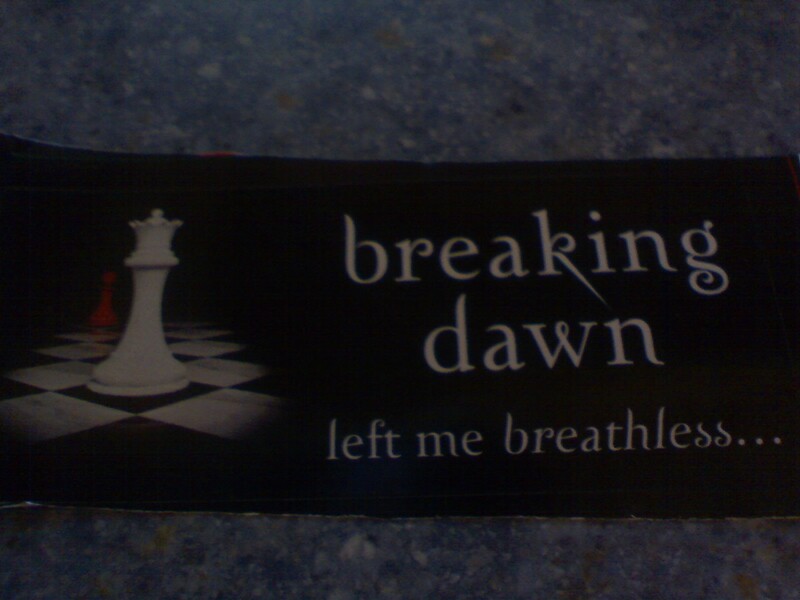 We had a round of trivia (sadly no contest), and we all received Breaking Dawn buttons and stickers, which I was then decorated with (thanks Sierra). 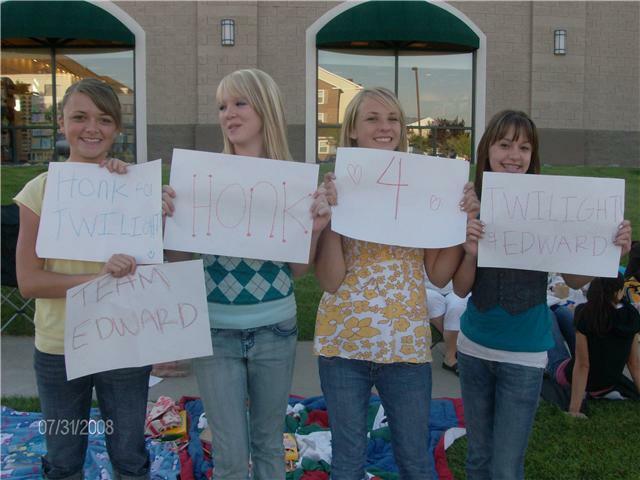 Time to mingle with other Twilighters! There wasn’t much planned after the trivia was over, and not much was going on, so we decided to head across the street Barnes & Noble to see what was afoot. These are some cool vampires we saw lingering outside the B&N! The scene across the street at B&N was a world away from the Waldens! 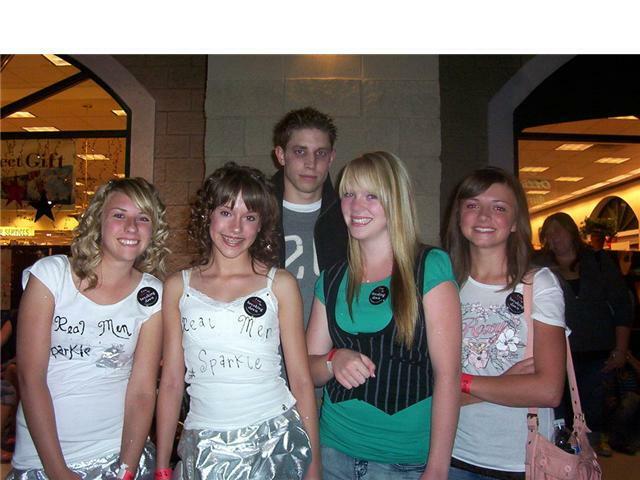 There was a DJ, a dance floor, glitter station, Wii setup, and wall to wall Twilighters. People were sitting in line, queued up throughout the store. Michael Jackson’s “Thriller” and “The Monster Mash” were pumped out of the stereo system, provoking a crowd of dancers. Below you can see Twilighters dancing to that monster classic, “YMCA.” Yeah, not really monster-like but whatever, it got people out there. I’m gabby and I went to the release party in Alabama. The few days leading up to the release party were stressful. 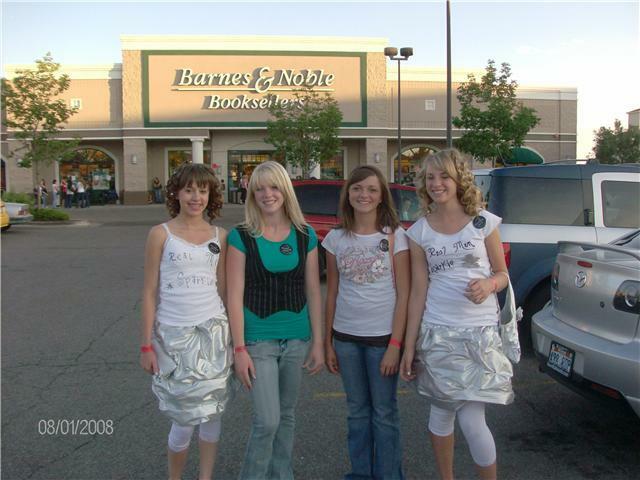 I had just arrived off the plane and was making plans for the barns and noble I was to attend. I was incredibly excited and couldn’t wait till I could finally hold this phenomenal book in my hand. 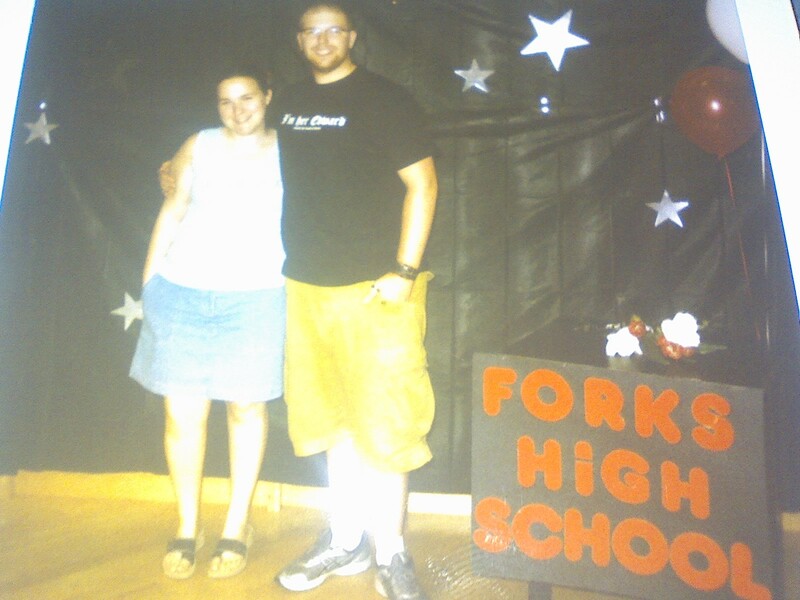 The day of the release party I hung with my friends Dustin and Danielle and my mom. I got my hair and make up done and I dressed up as Alice. I had planned to where an amazing tee shirt I made but ended up not wearing it until later. When we arrived at the party we were already late so I arrived just in time for trivia. Our team won, being able to answer every Question before any of the other teams had time to buzz in. We had a fashion show and I saw some amazing costumes. 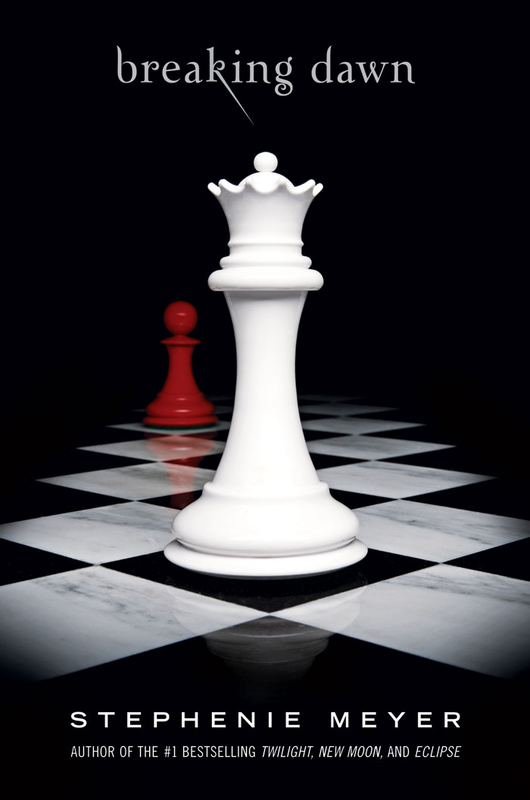 There was a lady in a wedding dress, there was a couple who were Alice and jasper and there was Victoria, and more. I had an amazing time but alas it was time to head home. 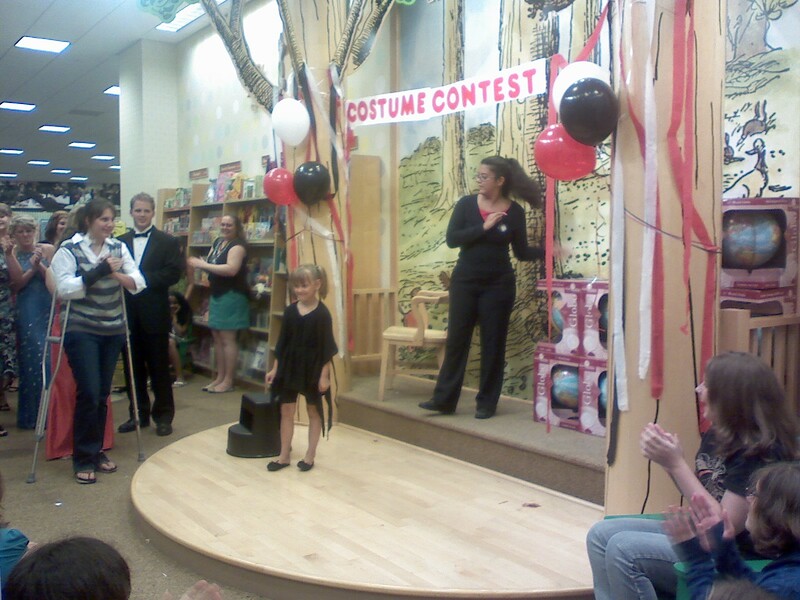 We decided that we would head home and stop at the books a million to check out there party. When we got there we were amazed. There was an amazing crowd there. 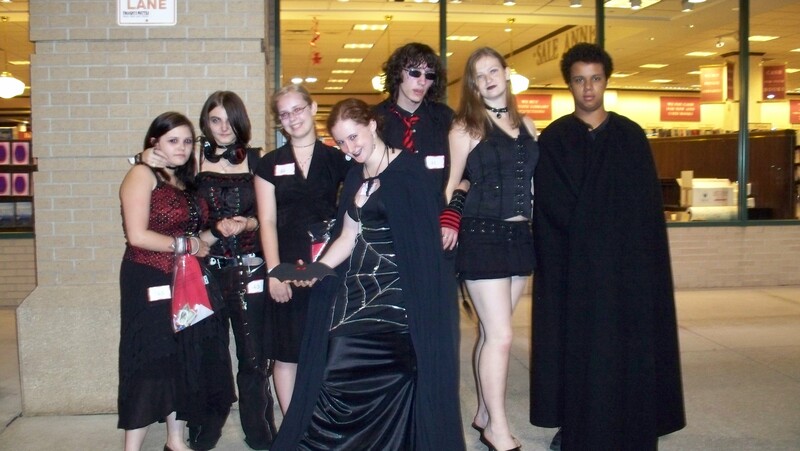 There were people dressed as the vulturi and as newborn vampires. I met a girl that had on an amazing vampire contest and she was incredibly nice. After partying it up there we finally got the book and the party was over. We headed on home while I couldn’t resist opening that book. Log in | 52 queries. 1.049 seconds.